Disgusting news. The Cliffsofmoher suffered a fractured right shoulder when injured in the Melbourne Cup, unfortunately could not be saved. "The horse received immediate veterinary care, however it was unable to be saved due to the nature of the injury sustained". 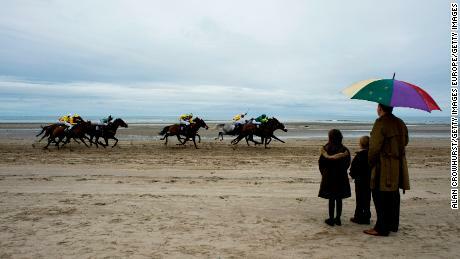 An official guides the finishing horses away from the stricken The Cliffsofmoher after the running of the Melbourne Cup on Tuesday. Racing Victoria confirmed jockey Ryan Moore was uninjured in the incident. The RSPCA spoke out against the horseracing industry with The CliffsofMoher the sixth horse to die at the Melbourne Cup since 2013. The Irish stallion had raced 17 times before today for three wins and five placings. There was also an outcry on Twitter, which one social media user writing: "The Melbourne Cup just ran and one of the horses was injured badly. i hope they're ok, I feel sick to my stomach". Mr O'Brien said: "Unfortunately these things can happen to a horse galloping around the field at home". The following year fan favourite Red Cadeaux shattered a leg and was put down on the track. Just a year ago Regal Monarch was also put down after breaking his leg at the carnival. The area was drenched with more than 46mm of rain falling on Flemington before 2.30pm (NZT), prompting fears jockeys and horses were at risk of injury.